For light to moderate sleeping problems reach for chamomile first. Drink a cup of calming and soothing chamomile tea before retiring, and you will drift off easily. Dried chamomile flowers are always an effective and sweet-smelling ingredient in herbal bath blends and sleep pillows. For a stronger sleep blend mix with skullcap , passionflower or lavender flowers . Generally used for treating insomnia, passionflower is a strong calming herb and is occasionally useful for severe daytime anxiety. One of the best and most studied herbs for insomnia, valerian allays pain and promotes sleep. It possesses none of the after-effects produced by OTC or prescription sleep aids. When you wake up restless in the middle of the night, and cannot get back to sleep because of nagging pain, valerian can help you fall back into restful sleep. The tincture is a convenient way to take it, especially if you have trouble getting past valerians earthy aroma and taste. . If your sleeping problems arise out of nervous tension and hormonal changes reach for the worts. Mugwort , and motherwort are two old fashioned herbs used to stimulate dreams and ease sleep that have a special affinity for women. Combine them with sweeter herbs like linden or lemon balm to mitigate the bitter taste. James Duke. "The Green Pharmacy Herbal Handbook" Rodale Books, (2000) Hops is a traditional cure for insomnia - a number of phytochemicals in hops possess sedative and muscle-relaxing qualities. Other compounds depress the central nervous system. Ashwagandhas acts as a mild sedative, and as indicated by its botanical name somnifera, it promotes restful, deep sleep. Steven Foster and Yue chongxi. "Herbal Emissaries" Healing Arts Press, (1992) Fo-Ti root is traditionally combined with jujubes and/or biota to treat insomnia. Maud Grieve. "Modern Herbal Vol 1" Harcourt, (1931) Passionflower is known to be a depressant to the motor side of the spinal cord, slightly reducing arterial pressure, though affecting circulation but little, while increasing the rate of respiration. It is official in homeopathic medicine and used with bromides, it is said to be of great service in epilepsy. Its narcotic properties cause it to be used in diarrhoea and dysentery, neuralgia, sleeplessness and dysmenorrhoea. Maud Grieve. "Modern Herbal Vol 1" Harcourt, (1931) The principal use of Hemp in medicine is for easing pain and inducing sleep, and for a soothing influence in nervous disorders. It does not cause constipation nor affect the appetite like opium. It is useful in neuralgia, gout, rheumatism, delirium, insanity, infantile convulsions, insomnia, etc. Phyllis A. Balch. "Prescription for Herbal Healing" Avery, (2002) A double-blind study of twenty people with insomnia compared the benefits of 0.125 milligrams of the sedative triazolam (Hal-cion) against placebo and a combination of valerian and lemon balm. 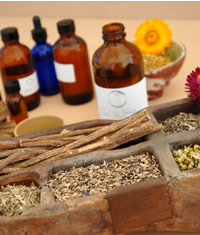 The herbal combination was found to be as effective as the drug.